Aleo BME’s proprietary citrate-based biomaterials are capable of modulating myriad metabolic pathways in all aerobic organisms. The Citric Acid Cycle, also known as the Kreb’s Cycle, is a series of chemical reactions used by aerobic organisms to release stored energy from carbohydrates, fats, and proteins, through the oxidation of acetyl-CoA and subsequent storage as ATP. In addition, the cycle provides precursors of certain amino acids, as well as the reducing agent NADH, all of which are used in numerous other biochemical reactions. Its critical role in many biochemical pathways suggests that it was one of the earliest established components of cellular metabolism. Mussels, the product of millions of years of evolution, are able to secrete a bioadhesive that uses catechol groups to chemically react with amine, thiol, and hydroxyl groups of under-water object surfaces. Ivy, the tendrils of which are known to tightly grip and dismantle aging architecture, relies on charged nanoparticles to form billions of intercalating bonds, both upon and within, the topology of a surface. Aleo BME has adapted these natural mechanisms and applied them to biomaterial design; creating biocompatible adhesives that can bind and secure wet and delicate tissues. Aleo's proprietary biomaterials have demonstrated intrinsic antimicrobial properties capable of providing a mechanism of bacterial resistance that has becoming increasingly important with the advent of antibiotic-resistant pathogens. The polymers’ highly tunable, biocompatible, and functionalizable structure makes it an excellent antimicrobial material for the use in medical devices or environment-protection coatings. Aleo BME's proprietary biomaterials can enhance wound healing by controlling infection, increasing antimicrobial activity, altering protease activity, reducing toxicity of bacterial end products, and accelerating angiogenesis and wound healing. When applied as a polymeric tissue adhesive or sealant, the polymers provide both unique bioactive and performance benefits for diverse surgical applications. Alpha-hydroxy acids (AHA), such as citric acid, originate from milk and fruit sugars and are the active component in many cosmetics. Among the many benefits of AHAs are their ability to exfoliate, lighten excessively pigmented, damaged skin, increase therapeutic absorption, and tighten wrinkles. 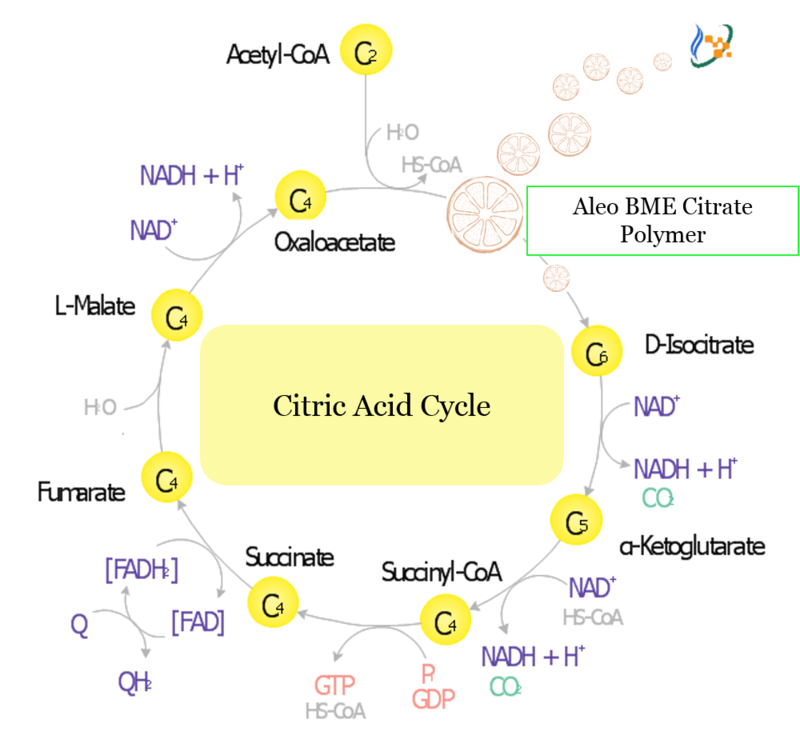 Aleo BME’s citrate polymers are the first successful conversion of an AHA solution into a dynamic biomaterial. The Warburg Effect is the observation that most cancer cells predominantly produce energy by a high rate of glycolysis followed by lactic acid fermentation in the cytosol, rather than by a comparatively low rate of glycolysis followed by oxidation of pyruvate in mitochondria, as in most healthy cells. This cycle allows cancer cells to burn the lipid and protein reserves of their host and to sustain their own biosynthesis pathways. The Citrate from Aleo's proprietary materials has demonstrated anti-cancer properties when administered in excess, and sensitized cancer cells to chemotherapy due to its role in regulating cellular metabolism. Aleo's proprietary biomaterials have demonstrated an ability to modulate plant metabolism interactions with other constituents of the rhizome as both a foliar spray and soil amendment. The mediated interactions can lead to improved yield, heat resistance, and more efficient water usage for various crops, including corn, soy, and wheat.